Racine, Wis., Cedar Bend, Root River. Photograph Courtesy of the Library of Congress Prints and Photographs Division. Lures expanded in popularity after World War II with technical improvements in the mechanics of spinning reels. This opened to way for less skilled fishermen to adopt the sport. The increased demand for lures soon followed. Mepps came along at just the right time and became a dominant part of the market. For a number of years Sports Afield and Field and Stream magazines held an annual contest for the most productive lure. From 1973 until 1985, when the contest stopped, Mepps lures was the winner each year except 1978 when they were in second place, a fact the company feature prominently in their advertising. Antigo, Wisconsin boasts not one, but two sources of fishing lures. In addition to Mepps, Antigo is home to Suick Lures, designed particularly for catching muskies and northern pike. Frank Suick was born in 1899. His parents owned a tavern near the railroad depot. Antigo was a major rail hub for the Chicago & Northwestern during the first half of the 20th century and many railroad men would hang out at the Suick family tavern, befriending young Frank. In the 1920s he would often travel north about 30 miles to Pelican Lake for a day of fishing. At that time it was a major trip if undertaken by car over poor quality roads. Young Frank, however, could hitch a train ride on the line heading north out of Antigo thanks to his friends who worked for the railroad. Main building of the Fresh Water Fishing Hall of Fame in Hayward WI. Photograph courtesy of the Fresh Water Fishing Hall of Fame and Museum. Soon an industry was born. The first commercial lures were offered for sale in 1942. The Suick Thriller, which comes in many sizes and forms, has been a popular lure for fishermen angling for muskie and northern pike ever since. For four generations the Suick family has been manufacturing a wide variety of lures in Antigo. The company recently celebrated its 75th anniversary and is still a family owned enterprise. Fishing is still a major tourist attraction in northern Wisconsin. A Fresh Water Fishing Hall of Fame and Museum exists in Hayward. In 1976 its main display building opened, a ½ block long and 4 ½ story tall building in the shape of a leaping muskie. Over 50,000 visitors tour the museum annually. Both Todd Sheldon of Mepps and Frank Suick, inventor of the Suick Muskie Thriller, have been inducted into the museum’s hall of fame. “Fishing Wisconsin Lakes and Streams,” April 21, 2016, http://www.travelwisconsin.com/article/fishing/fishing-wisconsin-lakes-streams. 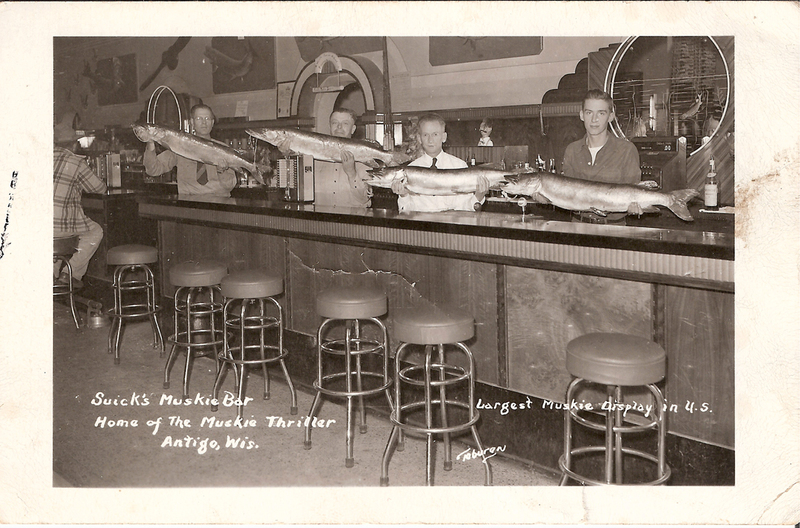 Featured image: Promotional picture postcard view of the interior of Suick’s Muskie Bar in Antigo. Photograph courtesy of Suick’s Lures.